Background: Recent epidemiological and experimental studies have shown that obesity is a major risk factor for Colorectal Cancer (CRC). Regular intake of high fat-containing diet can promote obesity and metabolic syndrome by increasing the insulin resistance and inflammatory response which contribute to carcinogenesis. Previously, we have shown that inhibition of polyol pathway enzyme aldose reductase (AR) prevents carcinogens- and inflammatory growth factorsinduced CRC. However, the effect of AR inhibition on a high-fat diet (HFD)-induced formation of intestinal polyps in Apc-deficient Min (multiple intestinal neoplasia; ApcMin/+) mice is not known. Methods: We examined the effect of AR inhibitor, fidarestat on the HFD-induced formation of preneoplastic intestinal polyps in ApcMin/+ mice which is an excellent model of colon cancer. Results: APCMin/+ mice fed for 12 weeks of HFD caused a significant increase in the formation of polyps in the small and large intestines and fidarestat given along with the HFD prevented the number of intestinal polyps. Fidarestat also decreased the size of the polyps in the intestines of HFDtreated APC Min mice. 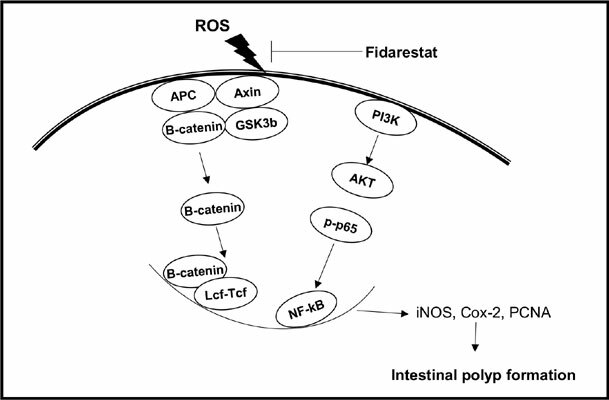 Further, the expression levels of beta-catenin, PCNA, PKC-β2, P-AKT, Pp65, COX-2, and iNOS in the small and large intestines of HFD-treated mice significantly increased, and AR inhibitor prevented it. Conclusion: Our results thus suggest that fidarestat could be used as a potential chemopreventive drug for intestinal cancers due to APC gene mutations. Aldose reductase, fidarestat, APC Min mice, high-fat diet, colon cancer, polyps.